Keeping these points in mind, we’ve put together a list of resources, plugins and services to use as an affiliate marketers toolkit, both paid and free. The goal of this affiliate toolkit is to provide you with as many resources as possible to build and maintain a successful and profitable affiliate website. If you think we left something out – make sure to send us your recommendation or your favourite tool, plug-in or resource and we’ll check it out! Most Affiliate Networks have a variety of tools to help both their merchants and affiliates succeed in affiliate marketing. Specifically on ShareASale, we’ve developed a number of tools to make it easier for affiliates to find relevant merchants and incorporate affiliates links into their website. Displaying products can be a far more creative and effective way to utilize Affiliate links. However, the challenge faced by most part time affiliates is the technical ability to cleanly display these products. ShareASale has solved this problem with the newest version of Make-A-Page. Affiliates can essentially build a custom table or a scrollable gallery of specific products to display on a post or page. ShareASale provides all the code necessary so it’s just a simple copy/paste; and in no time at all you have a nice display of products. Timesaver Tip: If you work with more than 10 Merchants, the product search can be overwhelming, so plan your table or scrollable gallery in advance. For example, if you are writing a post about the Chicago Blackhawks first game, avoid searching Make-A-Page for “Blackhawks”, instead try “Blackhawks T-Shirts” or “Blackhawks Accessories”. For additional information, read Make-A-Page Updated, and a New Feature for Bloggers and How I Made A Fun Interactive Creative – in 4 Minutes. The ShareASale Product Showcase is an interactive widget, primarily for your sidebar, but can be placed anywhere on your website. This widget will showcase products by Merchant, Keyword or Merchant+Keyword. The biggest difference between the Product Showcase and Make-A-Page is that you do notcontrol the specific products that appear. These products will automatically rotate based Merchant or Keyword (or combination of both). The Product Showcase is another creative way to utilize affiliates links outside of the standard text link or banner advertisement. It's a more eye-catching and higher converting way to advertise your favorite merchants. For additional information, read Create A Product Showcase For Your Blog in 5 Minutes. The ShareASale Bookmarklet (also known as the Product Discovery Tool) allows affiliates to capture affiliate links on the fly. Imagine you are browsing through the sales section on Fanatics, one of your favorite Merchants, and BAM, you realize their Chicago Bears Nike Women's Hoodie would be the perfect addition to your blog post on Fall Football Fashion. Simply click the "Bookmarklet Button" that you previously added to your browser toolbar, and the ShareASale Product Discovery window will pop up. From this window you can quickly copy the HTML code for the product image + affiliate link and paste it in your blog post. It saves you the time and hassle of logging into your account, searching for the merchant, then searching for the specific product in that merchants' datafeed. For additional information, read Product Discovery Bookmarklet Tool. ShareASale DealsBar - for automatically showing deals from your select Merchants to your readers. 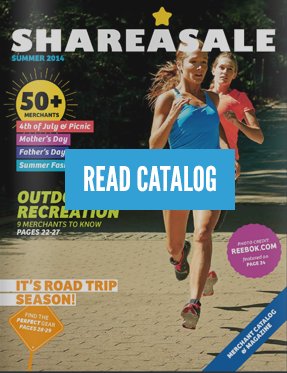 Your readers will be shown all current (automatically) deals from Merchants on ShareASale. You get to choose which Merchants to show on the Dealsbar, so if you only want to choose 1, 2 or All you can do that! It's a simple plug-in for WordPress and uses that ShareASale API to automatically keep you up to date. Download the WordPress Plugin for the ShareASale DealsBar here. Let's say there is a new product or an amazing landing page on a merchant's website, but they have no affiliate link to it in their creative inventory (banners, text links, product datafeed, etc). Not to fret, you can create your own. The ShareASale Custom Link Tool allows you to transform any link on a merchants' website into an affiliate link, as long as you are a member of that program. You can also opt to shorten this link so it's not hundreds of characters long. It looks a little classier. For additional information, read Can’t Find the Right Text Link? Create Your Own! and Best Practices for Creating A Custom Link. Many affiliates we work utilize WordPress to maintain their website and blog. Having maintained our own blogs and consulted with a variety of affiliates, we've come up with a list of WordPress specific plugins that are helpful for affiliates. Not only is WooCommerce a platform for eCommerce Websites, but it also useful for Affiliate Marketers. (Especially those just getting started, as there are certainly more technical ways to utilize products -- datafeeds and the API.) The WooCommerce Plugin allows you to add a product, as if you were selling it, but link it to a completely different website. You have all the functionality of an eCommerce store, but none of the hassle...collecting payments, shipping, returns, etc. If you are using a theme, be sure to choose one that already has pre-made layouts and integrations with WooCommerce. It makes the process just that much easier. Elegant Themes, Code Canyon and WooThemes all feature WooCommerce ready themes. Learn more about WooCommerce. The more targeted readers you reach, the greater the opportunity of clicks and conversions on your affiliate links. Search Engine Optimization (SEO) plays a large role in gaining targeted readers, but it can be a complicated and time consuming project to take on. The comprehensive plugin from Yoast SEO takes the confusion out of SEO. Not only does Yoast handle the more technical side of search engine optimization, but it also teaches you how to write more search engine friendly blog posts, allowing you to focus on your content and links. By selecting a "Focus Keyword", you can see how well your post is optimized for the search. This plugin also creates a custom XML Sitemap which is an important file to submit to Google Webmaster Tools. Learn more about WordPress SEO by Yoast. Affiliate marketers should attempt to capture as many email addresses as possible. Capturing an email address means you have access to that reader 24/7/365 (or until they unsubscribe). Everyone hates the idea of utilizing a pop up as a lead generation tool, but the research does not lie. They work. Opt-In Monster is one of the best lead generation plugins for your WordPress website. It is also one of the most expensive at around $49 for a basic license. If you aren't ready to invest the $49 for Opt-In Monster, Scroll Triggered Box by DreamGrow is another option. With a pretty basic settings section, you can choose on which pages to show the opt-in box, the box position and at which percentage of the page it should first appear. To change the color and style of the box, you'll need a little knowledge of CSS, but it's easily done. Learn more about Dreamgrow Scroll Trigger Box or Opt-In Monster. In case you missed it earlier, as an affiliate marketer, the number one goal of your posts or pages is to capture a users' email address. Think of the long term value it provides! If you are hesitant to use a pop-up as suggested above, use a simple call to action bar at the top of your pages, like Foobar. With Foobar you can add custom HTML for users to sign up for your newsletter, show your latest tweets, link to popular blog posts or link to top performing affiliate links. Learn more about FooBar or HelloBar. It's every affiliate marketers dream to have a post go viral. Imagine the traffic, the likes, the shares, the commissions! Prominent social sharing buttons on each post is a leap in the right direction. There are a plethora of social sharing plugins available, but one of the strongest is Easy Social Share. It has numerous design, tracking, sharing and advanced options available. The biggest downfall would be the time it takes to configure the plugin, but it's well worth it. Integration with WooCommerce, Google Analytics and Template Design are among the top reasons this plugin is worth the $14. If you aren't willing to fork over the $14 just yet, try out Simple Share. It's a lot less advanced, but it's lightweight and looks nice. Learn more about Easy Social Share or Simple Share. While Pinterest has blocked a lot of direct affiliate links, it's still a great source of traffic to your blog (which has affiliate links! ).According to HubSpot, Pinterest drives four times more money per click than Twitter and 27% more than Facebook. While displaying the Pinterest button in your line of social sharing icons is good, having the Pin It Button directly on your images is even better. Especially if you are creating beautiful, pin-worthy post images with Canva. Learn more about the Pin It Button Pro. When it comes to success in affiliate marketing, reader engagement and page views per visit can't be overlooked. One way to keep readers on your site longer is to display related posts - this can help reduce bounce rate and increase page views. Related Posts for WordPress is a nice, lightweight plugin with just enough custom features. You can choose the number of related posts to display, the expert length and heading text. You might have to tweak the CSS (provided on the plugin page) just a little to adjust image padding and width. Remember that this plugin pulls from your post excerpt, so if you haven't added excerpt information on your post pages, you'll need to go back and add the few lines of text. Learn more about Related Posts for WordPress. Affiliates with a high bounce rate will rarely be successful - and the two major causes of a high bounce rate are slow load time and irrelevant content. If you notice a slower page loads, you might consider a caching plugin like W3 Total Cache. While it does become a slight hassle to empty your cache when a new plugin is added or a major update it made, it does wonders for the response time of your site. The plugin claims at least a 10x improvement in overall site performance which can be incredibly beneficial when you are trying to grow your user base and reduce bounce rates. Learn more about W3 Total Cache. Affiliate Links are not pretty. They usually look something like this "http://www.shareasale.com/r.cfm?u=446641032&b=153936&m=20199322&afftrack=" and sometimes even worse when you start to add custom tracking. Many affiliates prefer presenting their affiliate links a little more professional to enhance their user experience. Pretty Link is among the most recommended plugins for shortening links as it offers a number of advanced features and options. It's also very simple to use. You can turn the above link into something as simple as http://www.yourwebsite.com/meditation-cushion. Depending on how your affiliate site is organized, you can also put each shortened link into a group to track the progress of either one specific affiliate network (ShareASale Links), one specific retailer (TinyPrints) or perhaps by a certain category (Sports). Learn more about Pretty Link. It's important to have a contact form on your website for two reasons - to be reachable to your readers and for potential merchants to contact you. Forms can also come in handy for product giveaway entries and reader feedback. There are two really slick plugins to create these types of forms, Contact Form 7 and Gravity Forms. Gravity Forms is the easiest to use, but it's about $39. Contact Form 7 has a slight learning curve, but it's nothing you can't figure out in about ten minutes -- and it's free. For advanced styling, you need to know a little CSS or download the Contact Form 7 Skins plugin. Learn more about Contact Form 7 or Gravity Forms. Are you protected if your website gets hacked? This is important for every website owner, especially affiliates. When your site gets invaded, your traffic is usually being directed somewhere else. This not only takes away from your potential affiliate commissions, but also loses trust with your readers. Wordfence Security can check if you site is infected, and specifically which files. It also has a built in caching system and is built to block known attackers. Learn more about Wordfence. Outside of plugins, there are a number of resources and services that can be very helpful to affiliate marketers - from creative resources to mobility services. These can all be wonderful additions to your affiliate marketers toolkit. Your readers love to be a part of your life. Instead of using another banner or merchant image, why not use an image of your own and make it a click-able affiliate link? If you don't know where to start, try Canva. Canva allows users to easily and quickly create beautiful graphics for blog posts, social media profiles, documents and much more. It makes the hassle of choosing a filter, selecting layouts and matching different fonts a piece of cake. Learn more about Canva. PRICE: It's free to upload and work with your own images, plus Canva has a number of free illustrations and images. You can also utilize stock images in your graphics, but you'll have to pay a fee. Usually it's about $1.00. Now that you have a wealth of content sources in Feedly, you'll want to save the articles that are the most interesting and important to you. This is where Shareist comes into play. Shareist allows you to quickly "bookmark" your favorite content (from Feedly or anywhere on the web); this content goes into an "inbox" in your Shareist account. From your inbox you can schedule when to post articles to your social media accounts or who to notify about certain articles (ie an Affiliate Manager). By far the best feature is the Calendar - you can use this feature to create an entire editorial calendar - schedule blog posts, social shares, invite authors, and much more. Learn more about Shareist. As an affiliate, a lot of your job is writing, researching and repurposing content (and products); as well as keeping up to date with your favorite merchants and networks. It's a time consuming job to sort through millions websites and keep them all organized. Feedly is a great resource for organizing article news feeds. You can create different categories (Recipes, Fashion, Humor, Local, Merchants, New Merchants, etc) for each of your news feeds...it becomes your own personal newspaper. Now instead of constantly looking through bookmarked content, you can login to Feedly and review the latest stories. Be sure to add the ShareASale news feeds to your Feedly account - New Merchant Programs, ShareASale Blog and ShareASale Coupons/Deals Database. Learn more about Feedly. Adding Google Analytics to affiliate site is the best way to gain insight on your users and their behavior. You can even setup event tracking on affiliate links you want to track as goals. You can sign up for a Google Analytics Account; then add the tracking code to your theme's header.php file. If you are uncomfortable messing with files, install the Headers & Footers Plugin. You can add the tracking code directly into the headers box within that plugin. You can also install the Google Analytics Plugin for WordPress to get a quick snapshot of traffic details when you login to your WordPress Account. As an affiliate, it is always better to purchase a hosting account, rather than rely on a free blogging platform's hosted services. Occasionally, free blogging services, like WordPress.com (vs. WordPress.org) will restrict affiliate marketing activities. So, it's best just to have your own paid hosting. There are a number of different hosting companies available, each with their own strengths and weaknesses. One major strength with GoDaddy, and why it's specifically mentioned, is that they make it very easy for the non-technical person. In about four quick steps you can have a hosting plan, a domain name, a database and WordPress installed. It's also very simple to add sub-domains, switch domains and add email addresses in a click of a button. Learn more about GoDaddy. Aweber is a great service for Affiliate Marketers and Bloggers. Tools to easily capture email addresses in WordPress, Templates for sending emails, and great stats to show you which of your subscribers are interested in what products. My favorite Aweber feature? They tell you who opened up a certain newsletter and with one-click you can immediately follow up with just that segment of your reader-base. Plus, the people are great, the customer service is top-tier, and the pricing will fit any Affiliate Marketers budget, you can get started for as little as a $1. Learn more here about Aweber. Every affiliate marketer should be capturing email addresses and sending regular emails to subscribers with affiliate links, blog post summaries and relevant articles. Don't underestimate the power of email marketing when it comes to your affiliate business. MailChimp is by far one of the easiest email service providers to utilize. It's intuitive, well designed and full of handy reports. Learn more about MailChimp. As an affiliate, you need to know the (literal) hot spots of your website. It will tell you where to put your top performing banners or calls to action (eh hem - email signup!). So, where are people clicking on your site? Crazy Egg answers this question and much more. With a membership to Crazy Egg, you can see a heat map of where people clicked on your site, segment clicks by traffic source, see how far down a page people are scrolling and actually breakdown the number of people who click on each link. Plans range from $9 to $99 a month. Learn more about Crazy Egg. A mobile friendly website is important! On ShareASale, 25% of traffic and 20% of transactions came from mobile devices in 2013 [see original article]. Most WordPress Themes are mobile friendly, but some more friendly than others. If you find your the mobile version of your website is less than desirable, try out WP Touch - a full mobile suite for WordPress. It's a pricier license ranging from $49 for one site to $349 for unlimited sites, but if mobile is an important part of your affiliate business, it would be well worth it. Learn more about WPTouch. When you draw a total blank coming up with your next blog post or brilliant affiliate marketing idea, try the Hubspot Idea Generator. Plug in the keywords your mind keeps circling around and the idea generator will spit out five different blog post titles and ideas for you. If nothing else, it will kick start your creativity. Learn more about the Hubspot Idea Generator.